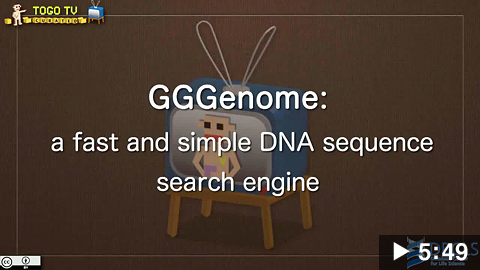 GGGenome is an ultrafast search engine for nucleotide sequences. Freely available to all users. Searches are always case insensitive. U and T will be treated identically. Ambiguous nucleotide characters (N, R, Y ...) can be used. All other characters are ignored. GGGenome shows 50 hits per page. Maximum 100000 hits can be retrieved as TXT, CSV, BED, GFF or JSON format. GGGenome search using Google Spreadsheet. Acknowledgement: We thank Dr. Noriko Furuya for making the tutorial video on TogoTV. Full list of databases is available below. sequence: Nucleotide sequence, case insensitive. output in html format (default). output in tab-delimited txt format. 2019-04-03 Database updated to RefSeq rel. 93 (Mar, 2019). 2019-03-06 nogap (no gaps in alignment) option is available. 2019-01-22 Database updated to RefSeq rel. 92 (Jan, 2019). 2019-01-09 Database updated to DDBJ rel. 115.0 (Dec, 2018). 2018-12-13 TXT/CSV/JSON output includes sequence alignment and numbers of mismatches etc. 2018-11-21 Database updated to RefSeq rel. 91 (Nov, 2018). 2018-10-10 Database updated to DDBJ rel. 114.0 (Sep, 2018). 2018-09-23 Database updated to RefSeq rel. 90 (Sep, 2018). 2018-08-03 Database updated to RefSeq rel. 89 (Jul, 2018). 2018-07-06 Database updated to DDBJ rel. 113.0 (Jun, 2018). 2018-05-28 Database updated to RefSeq rel. 88 (May, 2018). 2018-04-19 Database updated to DDBJ rel. 112.0 (Apr, 2018). 2018-04-19 Databases updated to GENCODE human 28 (Apr, 2018) and mouse M17 (Apr, 2018). 2018-03-22 Database updated to miRBase rel. 22 (Mar, 2018). 2018-03-22 Database updated to RefSeq rel. 87 (Mar, 2018). 2018-01-26 Database updated to RefSeq rel. 86 (Jan, 2018). 2017-12-30 Database updated to DDBJ rel. 111.0 (Dec, 2017). 2017-12-15 Databases updated to GENCODE mouse M16 (Dec, 2017). 2017-12-11 Carrot genome is available. 2017-11-17 Database updated to RefSeq rel. 85 (Nov, 2017). 2017-11-06 Database updated to DDBJ rel. 110.0 (Sep, 2017). 2017-10-17 Added stem-loop/mature miRNAs from miRBase rel. 21. 2017-10-17 Databases updated to GENCODE human 27 (Aug, 2017) and mouse M15 (Aug, 2017). 2017-10-09 Database updated to RefSeq rel. 84 (Sep, 2017). 2017-08-07 Database updated to RefSeq rel. 83 (Jul, 2017). 2017-07-03 Database updated to DDBJ rel. 109.0 (May, 2017). 2017-06-14 Silkworm genome (SilkBase, 2017) is available. 2017-06-09 Human Japanese Reference Genome JRGv2/decoyJRGv2 are available. 2017-06-09 GENCODE human 26 (Mar, 2017) and mouse M13 (Mar, 2017) are available. 2017-05-18 Database updated to RefSeq rel. 82 (May, 2017). 2017-04-20 Database updated to DDBJ rel. 108.0 (Mar, 2017). 2017-03-24 Database updated to RefSeq rel. 81 (Mar, 2017). 2017-02-17 Brassica rapa genome v1.5 is available. 2017-02-01 Database updated to DDBJ rel. 107.0 (Jan, 2017). 2017-01-20 Database updated to RefSeq rel. 80 (Jan, 2017). 2016-11-18 Database updated to RefSeq rel. 79 (Nov, 2016). 2016-10-03 Database updated to DDBJ rel. 106.0 (Sep, 2016). 2016-09-16 Database updated to RefSeq rel. 78 (Sep, 2016). 2016-08-30 Human Japanese Reference Genome JRGv1/decoyJRGv1 are available. 2016-07-14 Database updated to DDBJ rel. 105.0 (Jun, 2016). 2016-07-12 Database updated to RefSeq rel. 77 (Jul, 2016). 2016-05-26 Database updated to RefSeq rel. 76 (May, 2016). 2016-04-27 Database updated to DDBJ rel. 104.0 (Mar, 2016). 2016-03-18 Database updated to RefSeq rel. 75 (Mar, 2016). 2016-01-28 Database updated to DDBJ rel. 103.0 (Jan, 2016). 2016-01-25 Database updated to RefSeq rel. 74 (Jan, 2016). 2015-11-11 Database updated to DDBJ rel. 102.0 (Sep, 2015). 2015-11-11 Database updated to RefSeq rel. 73 (Nov, 2015). 2015-09-08 Added 14 genomes from Ensembl. 2015-09-08 Added 35 genomes from EnsemblMetazoa. 2015-09-08 Added 39 genomes from EnsemblPlants. 2015-09-08 Added 23 genomes from Phytozome. 2015-09-07 Database updated to RefSeq rel. 72 (Sep, 2015). 2015-07-22 Re-installed RefSeq rel. 71 (Jul, 2015). 2015-07-16 Suspended RefSeq rel. 71 due to a data error. 2015-07-15 Database updated to RefSeq rel. 71 (Jul, 2015). 2015-05-28 Database updated to RefSeq rel. 70 (May, 2015). 2015-03-18 Parameter for searching specific strand is supported. 2015-01-13 Database updated to RefSeq rel. 69 (Jan, 2015). 2014-11-23 Database updated to RefSeq rel. 68 (Nov, 2014). 2014-10-28 X. laevis and S. pombe genomes are available. 2014-10-01 CSV, BED, GFF outputs are newly supported. 2014-10-01 Sequence containing IUB code letters (N, R, Y, ...) can be queried. 2014-07-17 Marmoset genome is available. 2014-07-17 Database updated to RefSeq rel. 66 (Jul, 2014). 2014-06-02 Pig and Sorghum genomes are available. 2014-05-30 Database updated to RefSeq rel. 65 (May, 2014). 2014-03-17 Database updated to RefSeq rel. 64 (Mar, 2014). 2014-01-24 Database updated to RefSeq rel. 63 (Jan, 2014). 2013-12-25 S. cerevisiae genome is available. 2013-12-18 Database updated to TogoGenome from RefSeq 62 (Nov, 2013). 2013-11-17 Database updated to RefSeq rel. 62 (Nov, 2013). 2013-10-02 Database updated to TogoGenome from RefSeq 60 (Jul, 2013). 2013-09-20 Database updated to RefSeq rel. 61 (Sep, 2013). 2013-08-19 Tips: GGGenome search using Google Spreadsheet. 2013-07-28 Database updated to RefSeq rel. 60 (Jul, 2013). 2013-05-28 Chicken, Xenopus, Zebrafish, Ciona intestinalis and Arabidopsis genomes are available. 2013-05-21 Database updated to DDBJ rel. 92.0 (Feb, 2013). 2013-05-07 Database updated to RefSeq rel. 59 (May, 2013). 2013-03-28 Database updated to RefSeq rel. 58 (Mar, 2013). 2013-02-26 Search results are also available for download. 2013-02-12 Silkworm genome is available. 2013-02-08 English page has launched. 2013-02-08 Rice genome is available. 2013-02-06 Source code available via GitHub. 2013-01-16 Database updated to RefSeq rel. 57 (Jan, 2013). 2012-12-21 GGGenome REST API is available. 2012-12-21 Rat, Drosophila and C. elegans genomes are available. 2012-11-15 Database updated to RefSeq rel. 56 (Nov, 2012). 2012-07-26 Mouse genome is available. 2012-07-25 Database updated to RefSeq rel. 54 (Jul, 2012). This page is licensed under a Creative Commons Attribution 4.0 International License (CC BY 4.0).